Like the iPhone SE, which has the body of an iPhone 5s and the mind of an iPhone 6s (more or less), the new 9.7-inch iPad Pro looks very much like an iPad Air 2. Their dimensions are identical. Their screen sizes are identical. 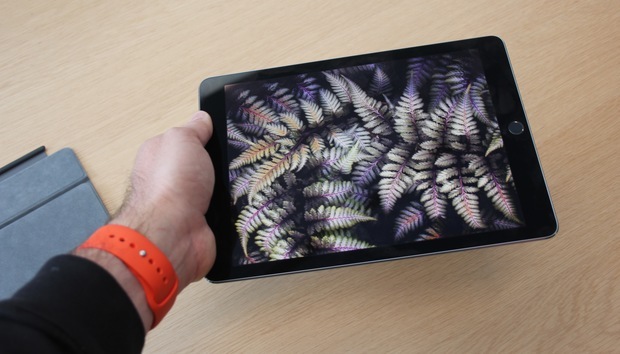 The 9.7-inch iPad Pro is very much the follow-up to the iPad Air 2, but with a different name. But beyond the basic similarities, there are some huge differences between the iPad Air 2 and the new 9.7-inch iPad Pro. Let’s start with the screen: It has the widest color gamut of any iPad, including the 12.9-inch iPad Pro. (It’s the same as the 2015 Retina iMacs.) It’s also the first Apple product to feature a “True Tone display,” though this isn’t technically a display technology. The 9.7-inch iPad Pro’s True Tone feature help match your tablet display’s color temperature to environmental lighting. Warm room lighting leads to a warm display (left), and cool room lighting gives the display a blueish cast (right). Here’s how True Tone works: For ages, iOS devices have had built-in light sensors that detect how bright the environment is, allowing software to automatically adjust the screen brightness. The 9.7-inch iPad Pro’s sensor goes one better, also detecting the color temperature of that ambient light. (Color temperature means that if you’re in a room with harsh fluorescent lighting, what your eye sees as white will be very different than in a room lit by warm incandescent bulbs, for instance.) 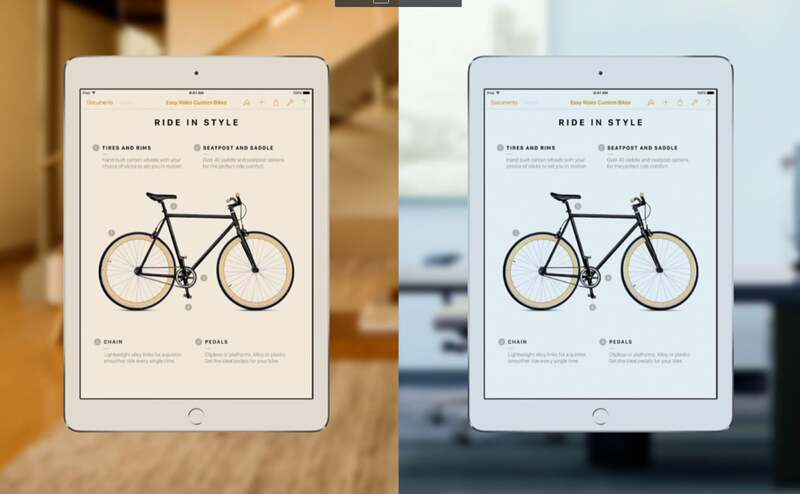 The iPad’s onboard software can then adjust the color temperature of its display, so that it matches the ambient light in the room. This is a very clever feature. (And yes, it’s one you can turn off with one switch in the Settings app if you don’t want to partake.) If you’ve ever sat in a dim, warmly lit room in the evening and flipped open your iPad, only to be taken back with how glaring and blue the white background of an app like Mail is, you’re a candidate for True Tone. If you used the 9.7-inch iPad Pro in that same room with True Tone turned on, Mail’s white backgrounds would be a warmer tone, and much less jarring. Unfortunately, I wasn’t able to test True Tone in an easy chair by a fireplace. Instead, I got to see it in the Piano Bar at 4 Infinite Loop, on a demonstration table after Apple’s media event on Monday. But still, the demonstration I saw was impressive: Setting the white point of the display to make it a little warmer really did make the iPad feel like it fit better into my field of view. The other new features of the 9.7-inch iPad Pro are ones that will seem familiar, because they were the highlight features of the iPad Pro when it launched last fall. First up is support for the Apple Pencil, and I think this is going to be an enormous hit. Yes, it’s amazing to draw on a 12.9-inch iPad Pro screen, but it’s also a very large object that can be hard to hold. The 9.7-inch model is six-tenths of a pound lighter and much more comfortable to hold in one hand. I was able to stand and doodle on an 9.7-inch iPad Pro easily, holding the iPad in my left hand while I drew on it with my right. The Apple Pencil is a perfect match for a 9.7-inch screen. Easy to hold the iPad up and draw at the same time! There are plenty of reasons to love the 12.9-inch iPad Pro and its big, beautiful screen, but it’s no longer the only device that’s capable of using the Apple Pencil, and that’s a good thing. As Tim Cook said on Monday, the 9.7-inch iPad has always been the best-selling product in the line, and now the most mainstream of iPads works with the Apple Pencil. I hope Apple has gotten its Pencil manufacturing process up to speed, because artists and students alike will be rushing to buy a Pencil to go with this new iPad. The other major iPad Pro feature coming to this smaller model is the Smart Connector and support for the new $149 Smart Keyboard designed just for the 9.7-inch iPad Pro. The size of the 12.9-inch iPad Pro means that its smart Keyboard sports full-sized keys, but that’s not possible with this new Smart Keyboard. Instead, Apple has shrunken down all the keycaps and especially squished the width of the Tab, Caps Lock, Shift, Return, and Delete keys. If you’ve used Apple’s Smart Keyboard for the larger iPad Pro, this one will feel familiar. I found typing on the new Smart Keyboard to be perfectly pleasant—it’s very much the same typing experience as the larger Smart Keyboard. However, if you’ve internalized the location of keys on a standard keyboard, you will probably be vexed by the shrunken-down layout of this keyboard. (And every time you switch back to a standard-sized keyboard, you will notice, too.) For some people, the reduced layout will not be a problem, but you should try typing on it in an Apple Store before buying just in case you can’t adapt to it. On the positive side, because the iPad is smaller, the Smart Keyboard is similarly smaller and lighter, so it adds less bulk to the 9.7-inch iPad Pro than its larger counterpart does to its iPad Pro. Still, give me an external Bluetooth keyboard any day. There are a few other things I noticed about the 9.7-inch iPad Pro’s exterior. The impressively updated camera appears to have more or less matched the iPhone 6s, meaning that this is the first iPad that can take pictures just as impressive as their iPhone counterparts. It’s been a long time coming. I know a lot of us think it’s ridiculous that people take photos with their iPads, but more of us are busy taking photos with our iPads! This new 12-megapixel camera (with support for 4K video) should make those pictures a whole lot better. (The front-facing camera has also been upgraded to a 5-megapixel model.) The wireless cut-out on the back of the cellular models has been redesigned, too. It’s more of a stripe now. Unfortunately, the 9.7-inch iPad Pro has also inherited the iPhone 6 family’s “camera bump.” In other words, the camera actually sticks out a little bit from the back of the case. It’s subtle but undeniably there. I’m not sure if it’s a big deal, but I know a bunch of people who are scared that the entire iPad will rock when you place it on a flat surface and try to draw on it with the Apple Pencil. I didn’t get a chance to try this particular disaster scenario, so I can’t say whether the bump is a big problem or not. Check out Jason Snell’s first look at the iPhone SE. As someone who uses a 12.9-inch iPad Pro a lot, I have to mention that there are several features of the 9.7-inch iPad Pro that have leapfrogged its larger cousin. The front and back cameras are two of them, and then there’s the True Tone feature, support for Retina Flash for selfies, and the expanded color gamut. Then again, the 12.9-inch iPad Pro still has a (slightly) faster version of the A9X processor, a full-sized keyboard, and 2.4 million more pixels. I still love my 12.9-inch iPad Pro, but there’s no denying that as of March 31, there’s a new top iPad in terms of features and popularity with the masses. It might have an unfamiliar and unwieldy name, but when you hold the 9.7-inch iPad Pro in your hand, you’ll know it’s the next generation of iPad, a true and worthy successor to the iPad Air 2.